During the first five episodes of The Simpsons; we’ve had two Bart episodes, one Homer episode, and two family episodes that you could qualify as Homer episodes. However, as far as the Simpson females are concerned, we’ve not really had much of a look at Marge, Lisa or Maggie yet. All of them provided relatively small supporting roles in the previous episodes and roles that could arguably be seen as unnecessary in moving the story forward. However, those times are a thing of the past as we have our very first Lisa episode today! “Moaning Lisa” debuted on February 11th, 1990 and was the sixth episode written and aired for the first season. The chalkboard gag is “I will not instigate revolution,” and the couch gag involves the family sitting down on the couch with Maggie popping out and Marge catching her as she is falling. The episode starts with a very glum Lisa Simpson. She’s very slow at getting ready for school, doesn’t seem very amused in her family’s morning antics, and lets her father and brother eat the last of the remaining cupcakes; claiming that one cupcake will not bring her any happiness. Later at school, when trying to express herself through her saxophone playing, her music teacher, Mr. Largo, scolds her for not following the instructions. Then to top everything off, during gym class she doesn’t seem to be in the mood to play dodgeball for the sole reason that she is ‘sad.’ Lisa’s teacher sends a note home telling her family about Lisa’s sadness. The family doesn’t seem to understand why Lisa is feeling this way, and tries everything they can to make her feel better. Even Bart tries to cheer Lisa up with a prank phone call to Moe’s Tavern. However, all of their efforts don’t seem to lead anywhere. The only thing that seems to put her mind at ease is music and playing the ‘blues’ on her saxophone. While practicing, Lisa hears another sax playing in the distance and sneaks out of the house to follow the sound. This is where she meets a fellow sax player and jazz musician “Bleedin’ Gums Murphy.” They exchange words and then start playing together into the night. Meanwhile, after having dreams about how to help Lisa, Marge notices that Lisa is missing from her bedroom and follows the music to find her at the bridge and take her home. The next morning, Marge tells Lisa some advice her mother once gave her; to smile and never stop smiling, even if she doesn’t feel like it, as it will be the key to making friends and getting other people to like her, thus making her more happy. Lisa tries this, but the other kids start trying to take advantage of her and her smarts by asking her to do their homework, and Mr. Largo makes a very demeaning and sarcastic comment in regards to her musical outburst the other day. This upsets Marge and she immediately pulls Lisa back into the car. She tells Lisa to forget everything she told her to do a few minutes ago and that if she wants to be sad, than she should be sad and let her mother do all the smiling for the both of them. This finally strikes a chord with Lisa and she starts to smile, saying that she finally feels like smiling. Meanwhile, while this is all going on, Homer has his own little story for this episode. Yeah, you could call this the first Simpsons episode that has a “B-Plot” of sorts, or a story that complements (or just featured alongside of in some cases) the main story of the episode. In this particular B-plot, Homer is on an amazing losing streak with Bart on their “Video Boxing” video game. Homer’s constant losing is starting to affect him to a large degree, mainly with him having nightmares of Bart beating him up, so he decides to pick up some tips from the local video game arcade. He trains with a kid who teaches him everything he needs to know and challenges Bart to one final match. During the match, Homer finally starts to do well and is about to knock-out Bart for the final blow, but before he can perform the final move, Marge comes into the room with Lisa, unplugs the video game system, and tells Bart and Homer that Lisa wants to do something the entire family will enjoy. Bart takes this instance to announce his retirement from Video Boxing with an undefeated record while Homer sobs that his golden moment was taken away from him. The entire family goes to the Jazz Hole where Bleedin’ Gums Murphy is performing the song that he and Lisa played the other night, ending the episode. I had to have seen this episode at some point in my life, but I can never recall if it was from a clip show or the actual episode. 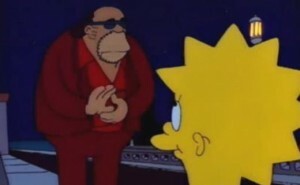 I was very aware of the Bleedin’ Gums Murphy character and his relationship with Lisa, how Lisa looked up to him and how he was one of Lisa’s biggest inspirations when it came to music and playing the saxophone. However, I might be thinking of “Bart’s Dog Gets An F” in Season 2 where Lisa stiches an image of Mr. Murphy into the family quilt. Regardless, that is a plot point that has always stuck with me regardless, which I guess makes this episode a little iconic, in a sense. One thing I would like to point out though is that, as a kid, I did own (and still probably do own) “The Simpsons Sing the Blues” album. This was basically a CD that features around 10 or so songs sung by Simpson’s characters. Most of the songs were original songs made for the characters, and some of them were actually used in animated music videos for the show as well, like “Do the Bartman” and “Deep, Deep Trouble.” A longer version of Lisa’s song in this episode, from her jam session with Bleedin’ Gums Murphy, is actually on the CD, and that was something I always enjoyed about watching this episode; finding out where that reference came from. I think at the end of this post I’ll include a link to the song or something, but yeah, I felt like mentioning that. This is definitely an episode that relies more on emotional responses and character development than on jokes and humor. However, there is definitely some humor that can be found here still. Whether it’s the return to the Moe’s Tavern prank call joke, where Bart uses the name “Jacques Strap” (for jock strap), or the silliness of the sub-plot of Homer going to an arcade to get tips for beating his son at a video game, there were definitely some laughs to be had in this episode. The fact that Homer is becoming so scared of his son because of the video game is priceless, and the scream he makes when waking up from the nightmare is probably one of the best Homer screams of all time. I also think this episode features a really good Maggie joke where while Bart and Lisa are trying to get Maggie to choose which sibling she likes best, and in what will be classic Maggie humor, she chooses the television over the two family members. I think my favorite joke though is at the end of the episode when the family is listening to the song Lisa wrote. The family is just sitting there, listening to and enjoying the music, and when the song gets to the line about Homer acting like he belongs in a zoo, Homer just pauses for a second, realizes what was just said, and exclaims, “What?” in just a hilarious fashion. I think the greatest individual moment of the episode though is when Marge finally realizes what she needs to do to make her daughter happy, and it’s by letting her daughter express herself in the way she wants and needs to, and by not trying to fix or change her. The advice she tried to give to Lisa; about smiling no matter how you feel…I never quite understood what the writers were trying to go for with that until very recently, and a large part of that realization is due to this retrospective series, where I’ve started analyzing these episodes a little more and seeing these things in different ways. 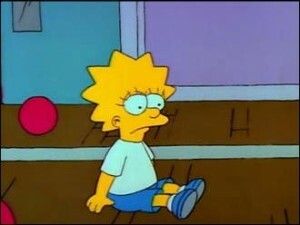 At this point in the episode, the family has tried numerous times in trying to get Lisa to feel better, all of which have not been successful. The only thing that has been successful is Lisa’s expression through music, something the family has not really understood yet. So at this point, much like her teachers, Marge and Homer are telling Lisa what to do and how to feel, which just doesn’t work and is, if anything, the root of her sadness in the first place. When Marge sees how badly her suggestion is doing, she realizes that she was wrong and tells Lisa that it’s fine to feel sad if she feels that way, and that makes Lisa happy because she has that control now and she can use that sadness to further develop her music, in which she is very much invested in. It took me way too many years to realize that, but I am glad I can finally understand it now, because it does increase my overall appreciation for this episode. I feel like I’m hitting the review section kind of early here, but after thinking about it, I really don’t have much else to say about this episode. To be quite honest, going into this retrospective, this was probably my least favorite episode of the six I’ve taken a look at so far. I feel I must stress that it’s not because I think this is a bad episode, by any means; this was just an episode I was incredibly neutral about. It’s nice they went for a more emotionally driven plot with this episode, but I guess for me growing up, I was definitely more about the humor than the emotional responses. These days, since I am well into my adulthood now, I can look at these episodes with a bit more understanding and more of an open mind. I’m not saying all kids are like this, heck, there were probably some kids out there who could relate with what Lisa was going through, but for me, I didn’t grasp all of that at first, and I’m glad that I do now because there is definitely a solid story here. With that being said though, I wouldn’t say that I’m completely turned around on the subject. I definitely appreciate this episode a lot more and it’s nice to see the start of Lisa’s character development (especially after focusing so much on Bart and Homer on the episodes before this), but like…I wouldn’t be surprised if people start to lose interest during the middle of this episode. It’s kind of like “There’s No Disgrace Like Home” in a lot of respects, where it has some great moments, but they are towards the end of the episode, so you will only feel the impact of those moments if you stuck around and didn’t change the channel or turn away beforehand. And for that, I do see that as kind of a weakness for this episode despite the good moments that it does have. Also, the sub-plot with Homer and Bart, and the videogame? Although not the worst B-plot in the Simpsons’ history, it is very weak and doesn’t really complement the main plot of the episode that well. 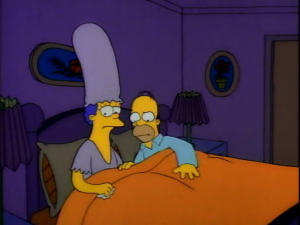 I honestly would have rather seen Homer and Bart try (and fail) to cheer up Lisa more and maybe come to a similar realization like Marge did, but in their own elements and in ways that would better benefit their individual character relationships moving forward. I ultimately feel like the writers were trying to stuff more jokes and gags into the B-plot because the A-plot was so emotionally-driven, but because of that, they prolonged the emotional moments and if anything made the episode a bit less focused on the main plot, which probably cheapened the overall experience. However, the Simpsons will go on to do many emotional episodes in the future, particularly ones involving Lisa, and I have to say that the stories do not disappoint. For a first season episode and attempt, I will give props to the writers for going through with this story, because I do think it’s an important episode moving forward. It’s important in the sense that it helped make The Simpsons not just a cartoon show with jokes and gags being delivered every few seconds like Looney Tunes, the Flintstones, and Tom and Jerry, but also a show that focuses on delivering a good story and some emotion alongside the humor. And with that, let’s let our little girl of the Blues, Lisa Simpson, play us out as we close this episode. Have to admit, this was a fun episode to look at because it wasn’t an episode I truly appreciated until much later on in life. It makes me curious to watch the rest of the episodes from this season, especially in the near future, because we have some episodes coming up that I’m not the biggest fan of and I kind of wonder how I will feel about them when it comes around to this retrospective. So yeah, I’ll see you guys next week for another episode, and maybe at this rate, I may get a few more finished before my vacation after all.